In the beginning of my calendrical life, there was a small book with twelve monthly calendars and the days divided into little squares. With tiny handwriting, one could fill in the squares. 10:00 Dentist. That sort of thing. There was often an address book in the back, and perhaps a couple blank pages for notes. Business people had those Day-At-A-Time flip-desk calendars. Lots of room to write things in. And there were wall calendars. Some had monthly photos — not always PG. That was pretty much it…until The Planner. These were calendars that were color coded. They came in various sizes, and some became so large it was like having an extra bag to carry. Within these calendars some people began color-coding tasks. Red for work. Green for personal. And so forth. There were also “At a Glance Planners” for days, weeks, and months. These could also be color-coded. That changed in 1997 with the Palm Pilot. 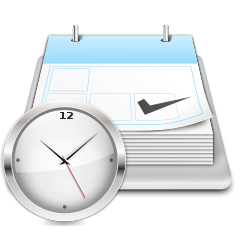 A digital calendar and note taker. Blackberries, released three years later, served the same purpose plus email. Within about ten years, smart phones took over. Not just a phone, calendar, or email device. Smart phones text and have internet connections. The operator holds a computer in her hand. The trendy thing now is Bullet Point Journaling – a throwback to blank journals and At a Glance Planners. The Bullet Point Journal starts with any sort blank journal and a pen and becomes whatever you want it to be. I discovered Bullet Point Journaling while looking for tips on making resolutions. Susie Lindau blogged that the system is far more useful than resolutions as a means for setting goals. She started making short term goals and planned their execution 7-10 days ahead, with the extra fun of filling in the empty blank for each completed task. 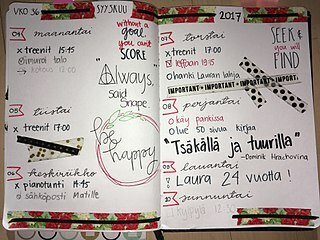 The first thing to know is that people who like bullet journaling, like it a lot. They like having everything in one portable place. They like using pen and paper. They like to Doodle…errr… Decorate. They like to write notes to themselves and make task lists. They like creating pages that may look like this. The Lazy Genius Collective compares a bullet journal to a potato. It may seem boring and bland, but what makes the potato special is all the things it can become. Couscous, for example, can never become a French Fry. Likewise, the bullet journal begins with a blank journal you can easily take everywhere, and a pen. The retro analog system engages the brain more than tapping a keyboard. For example, it takes longer to write things than to type them, so you only jot down what is truly important. If the bullet journal is like a potato, its first page (called the Index Page) is like butter on the potato. Butter gives the potato flavor; the index gives the journal magic, because it tells you where everything is. You might start “summer vacation” on page 10, move on to other things, and return to “summer vacation” on page 25. You record the pages for “summer vacation” in the index. And so it goes. You set things up however you like. The Index is usually followed by Future Log for planning, Year at a Glance, and Monthly pages which may include the calendar on the left and the appointments and tasks on the right. You can do the same with a daily log, which the Lazy Genius Collective calls the knife and fork of the potato. ☐ A task has an empty box beside it. When you complete the task, fill in the box. △ An appointment has an empty triangle beside it. When you fulfill the appointment, fill in the triangle. ◦ Dots go next to items you want to remember. ❤️A Heart goes next to memories you don’t want to forget. I’m a linear person. I keep my calendar in my smartphone and my tasks embedded in the calendar. When I finish a task, I gleefully delete it. When I finish the day, I make the next day’s list. Most people are not linear. Bullet Journals are popular, because the writer feels productive for doing just about anything. If you complete one the task list, you get to fill in the box. And you can start a fresh page any time you want a life restart. Bullet Point Journaling isn’t for everyone. In particular, it isn’t for me. But it’s not too late for you to start your own journal. 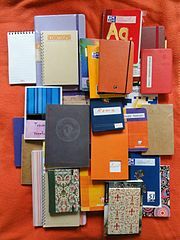 Unlike calendars which dictatorially start on January 1, a Bullet Point Journal can be started on any day you like. As an old commercial for Anderson’s soup says, you can do it today, tonight, or a week from Tuesday. If you want to try things out, Carrie Crista’s Beginners Guide to Bullet Journaling is a good place to start. If you want to see how elaborate these journals can become, scroll down to AmandaRachLee’s My Bullet Journal Set-Up 2018. I’m going to catch up with my iCal. Oxygen 4.8.0 from “Apps” group. Free Software Foundation. 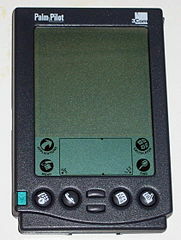 Old School 3Com Palm Pilot. Free Software Foundation. Bullett Journal by Nea.salo. Creative Commons Attribution. Paper Notebooks by Mattes. Public Domain. Jane Thomas. “Why Is Bullet Point Journaling Popular?” Slate. Jan. 13, 2017. Rachel Wiolkerson Miller and Ellie Sunakawa. “WTF is a Bullet Journal and Why Should I Start One?” BuzzFeed. May 31, 2016.